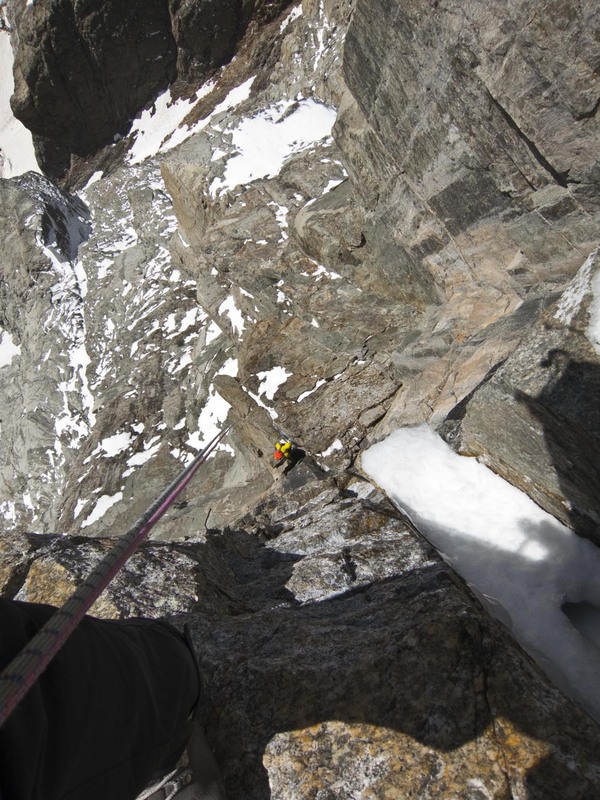 I always look over my right shoulder when I arrive in Italy after exiting the Mt Blanc tunnel, to have a wee swatch at the Peuterey Integral. All these times that I've stared at this huge ridge line, I've been in awe knowing that I'd climb it someday. Exiting the tunnel this time felt slightly different! I've never studied the route in fine detail before. In fact I've never known much about it apart from that I knew it was quite long.... 4500m long! It's amazing the feeling of starting from the floor of Val Veni, then making your way up this epic line and finishing on top of Mt Blanc. Ben Tibbets and myself had never climbed together before, so it was going to be interesting to see how we developed over the next few days. I was sure that we would learn how each other worked by the end of it! The fact is, is that we both got on really well from the start. After Susie dropped us off in the car park Ben and I headed up to the Boerelli hut which took 1.30hrs. The hut was un-manned so it was nice to chill out, spread our stuff around and feel relaxed before our adventure. 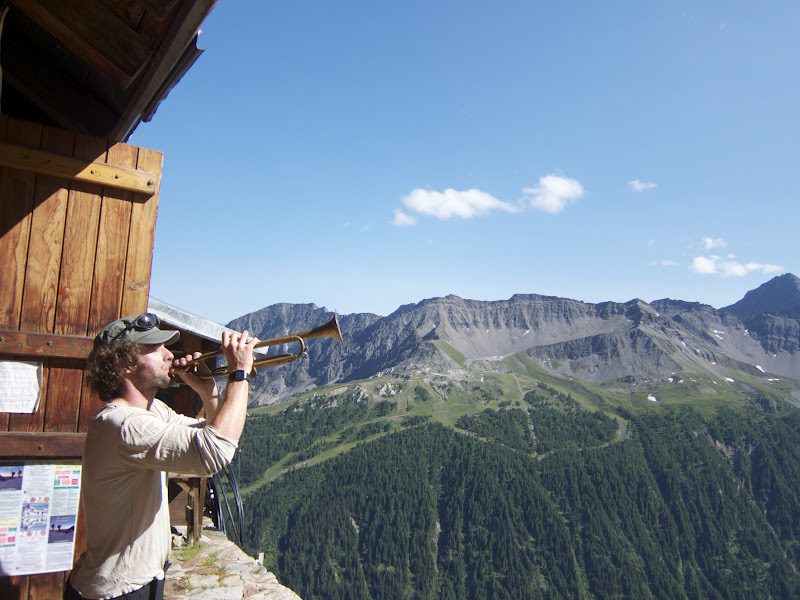 Ben blown his own trumpet! Feeling quite relaxed at the hut! 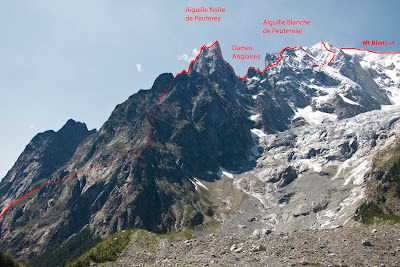 So we left the hut at around 3am and walked up the easy angled moraine slopes to reach the base of Pointe Gamba, which is the starting point of the Peuterey Integral. As we were getting the gear out and putting the rope on, I noticed a previous party had made a rather large error.... Someone had left their crampons at the start of the route! 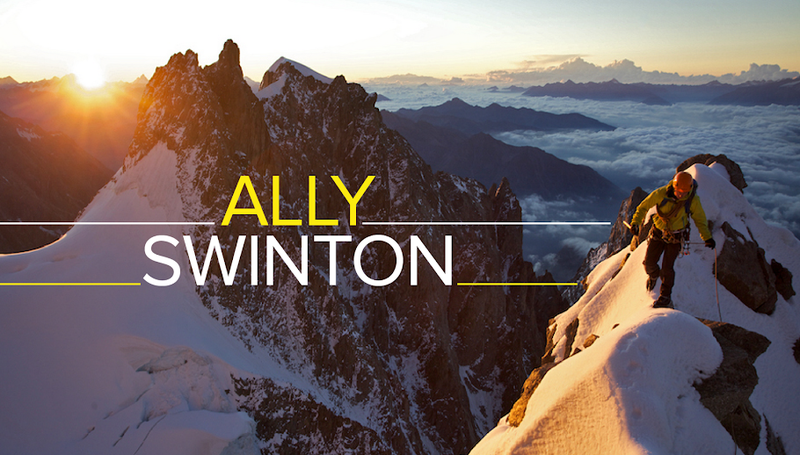 And if they didn't notice in the first 24 hours, I'm sure they'd notice before they got to Mt Blanc. We just got moving together straight away which is what this route is about. Even though there is a lot of mild climbing on the S ridge of the aiguille Noire, there are a few techy, thuggish and awkward moves along the way. There tends to be good belay spots where most of these moves are, just to give the leader a bit of confidence and then once through the moves you can start to move together again. The second crux pitch groove. Just a wee bit to go! After the reaching the summit and spending a little time with Mary doll. We had just a few abseils to do! 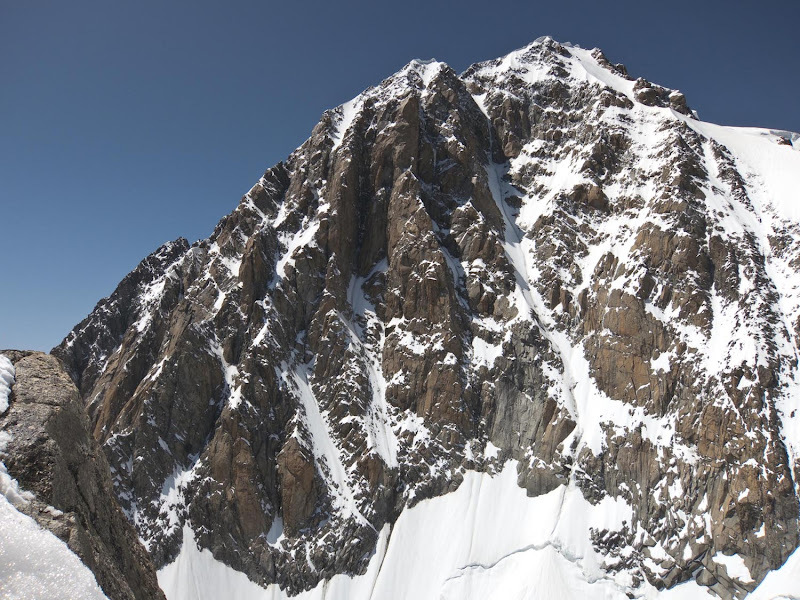 The summit of the Noire is at 3772m and you have to do 12-14 abseils down to the S Breche of the Dames Anglaises, which is roughly 400m below. There's one main abseil which spits you off so that your hanging in the air. 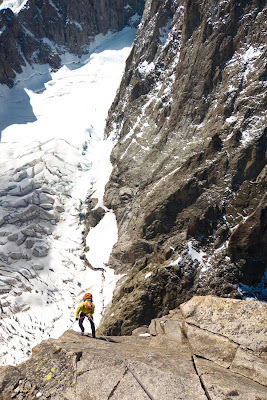 Whilst you're hanging high above the first set of ledges below you, and even higher than the ones below them, and then even higher above the Freney glacier which is a few hundred metres down, you get a slight feeling of insignificance. All the way down you have these mule kicking feet which are struggling to flick your body around and allow you to get some sort of purchase on the first rocks you come into contact with. Weather starting to build up! Once you're finished with the last abseil you find that you have arrived in hell's kitchen, your only hope is that you're not on the menu! To quote Ben, 'The Dames Anglaises is the chossy armpit of Satan.' 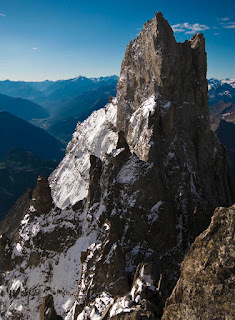 The rock in the Dames Anglaises is some of the shi**est I've ever seen and climbed on. We kept the ropes off in this area and climbed really close together, so we didn't pull something onto each other. It's really mellow angle, then it steepens up when you arrive at the arete which takes you to the summit of Pointe Casati. From here you have 3 abseils that brings you to the Centrale breche, where you have two options. Either climb up Pointe I'Isolee and abseil down to the N Breche, or you traverse round and climb up to the N Breche. We chose the latter option as the guide said it was quicker, but unfortunately throughout the day we had a few route finding errors and ropes stuck on abseils meant we were climbing here at 1 o'clock in the morning. And our route finding brains were starting to slow down. It took an extra hour and half to arrive at the N Breche of the Dames Anglaises, where the Craveri Bivouac shelter is situated. Crawling into the shelter at 2.30am felt so good. What didn't feel good was the fact that we needed be up in 3 hours to make the most of the next day! Am not going to lie, we felt crap getting up at 5.30am to start climbing again. Took a while for the brain to warm up and get everything functioning properly. However once we made it through the first sections and started making our way across the slopes of Pointe Gugliermina we felt ok and were moving quite well. There was a lot of fresh snow around this area which didn't make things any faster, but the weather did hold out for us at least. Rich blue skies, peaceful air and sun beaming down on our necks, we knew we were in Italy! Leaving the Cravari hut in the morning. Walking up the snow slopes on the Aiguille blanche de Peuterey actually felt quite nice, as we knew we were past all the rock sections and it was all snow plodding from now on. A lot of snow plodding.. but still. The half moon shaped snow crest, which you cross to gain Pointe Centrale and then Pointe NW, was quite exciting. From Pointe NW on the Blanche de Peuterey there are 3 big abseils to get down to the Col de Peuterey, where we arrived at about 3 o'clock in the afternoon. We were both quite tired by this point and wanted to drink and eat a something before setting on up the final part of the Integral. The major down side to arriving here this late was that the sun had properly cooked the snow. Usually on the first section up to the GPA you climb the Eccles couloir, but it didn't like much fun so we followed a track up the face to the right which had been put in earlier. As we were there quite late in the day the track was no use apart from a guide of where to go. It was annoying as it was better to break a new trail rather than use the original. It's a real shame as it would have made things a lot quicker and easier for us. When we reached the top of the GPA, two guys came climbing over and said that they had just done the 'Bovin' route from first bin! 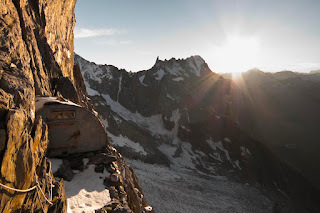 I couldn't really believe this as most people would start really early from the Fourche hut so they'd be going under the Brenva seracs in cooler temps. You never know though as there are a lot of dark horses around this area. 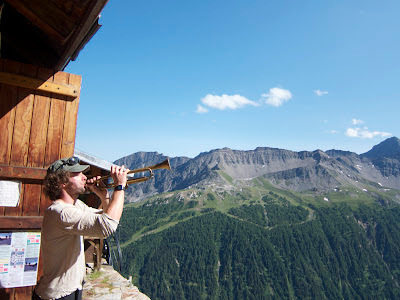 However they didn't feel like carrying on up to Mt Blanc that evening. So they decided to bivvy on top of the GPA which was quite annoying as we thought they could re-break trail for us up to Mt Blanc de Courmayeur, but no they had to selfish and settle down for the night. I hadn't eaten much all day, and decided to have a few caffeinated energy gels to get me up this snow ridge, which worked really well for most of it, but nearing the top a started to flag big time. I just thought I was getting tired, which obviously was part of it, but I think I was starting to have a big caffeine/energy crash as I had nothing in my belly. I told myself that when I get to the top I'll have something to eat and drink then, but as we pulled over the lip and arrived at Mt Blanc de Courmayuer we were greeted by a very welcoming storm! The winds were really strong and cold, probably 50kph with -20 wind chill. So we just carried on walking to Mt Blanc, whilst shielding our faces against the harsh winds. By this point I was really starting to feel weak, dizzy and stottering about like some drunk. The summit was celebrated by a very quick hand shake and hug, no photos, no chit chat and no views. 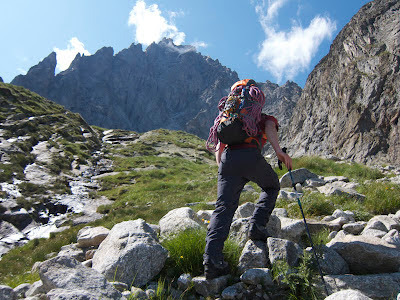 We quickly started heading down via the three Monts route back to the midi. On the way we tried to find some sort of shelter, but the wind was howling around every slope. So eventually we just dropped to our knees, huddled together, got bags in front and put bits of food in our mouths and sipped some semi frozen water. We managed to follow a very rough and vague track, but last it every so often as we were only able to look at our feet due to the winds, and your eyes sometimes lost the track. There were no ropes in place at the Maduit slope, so we quickly got the rope out and made two short abbs, rather than down climbing. After the abbs we decided to put the rope on as we knew there were a few crevasses in this area, and I'm so glad we did. I think that this slope has changed a lot since that tragic avalanche which claimed 9 lives. We walked in the general direction where the track has always gone but as we never seemed to cross any crevasses, we were really cautious as we weren't sure where we were exactly on the slope. We had to down climb some sections that were steeper and had been scraped by the avalanche. This whole area was made even worse that we were caught in this constant spindrift which felt like someone was throwing sand in your face continuously. We had our eyes closed most of the way down, and if we had to see where to go we looked through the gaps between our fingers whilst we held our hands over our faces. The winds calmed down a lot after this, and totally stopped at the col du midi, where we met the first people of the day to be heading up Mt Blanc. We told them how the weather was up there, but didn't want to hang around long as we knew we had sleeping bags waiting for us in the Midi station thanks to Graham & Lorne. We arrived at the Midi for 2.30am! It felt so good to get some fresh food and water in us, but after a 42hour push with 3 hours sleep, the only thing on our minds was.....zzzzzz. When we got up a few hours later to get the first lift back down to Chamonix, we received the amazing news that the lift station was closed for the day due to high winds. This news almost destroyed us, but to be honest the only thing to do up there was sleep which is something we needed to catch up on! Feet not looking their best! Snug as a bug, in a... sleeping bag! Me catching up on the zzzzz's, along with a few more. Ben didn't want to move in case someone stole his seat! The route was amazing and the whole thing was pretty epic to say the least... Thanks Ben for an awesome experience, and thanks to everyone else who helped out. Hows it going baw bag? heading out to ceuse for 2 n a bit weeks on the 27th. You going to stop walking up big hills and come cragging for a bit? I'm driving so if you want anything brought out from the kingdom geez a shout. Don't have facebook just now.